Reader Zach Savage of New York hosted a party with his roommate a few nights ago. “I came across a powerful nudge,” he writes. At the party, my roommate and I set out six bottles of wine on a table. The wine bottles were still corked, so we put a corkscrew next to the bottles. We also offered other drinks – beer, eggnog, and cider. After the party had been going on for about 30 minutes, I noticed that our guests were drinking the beer, cider, and eggnog very quickly, but nobody was drinking the wine. I thought people might need a little nudge to induce them to drink the wine, so I opened one of the six bottles. Within about 10 minutes, that bottle was gone. However, the other 5 bottles were still untouched. I opened another bottle, and again, that entire bottle was consumed within about 10 minutes, but nobody had touched the other four bottles. I then opened the four remaining bottles, and by the end of the party, they were all gone. It was very clear that what determined whether someone drank a particular bottle of wine was not whether they liked the type of wine in the bottle, but whether or not the bottle was open. Just where were the oenophiles at this fine party? 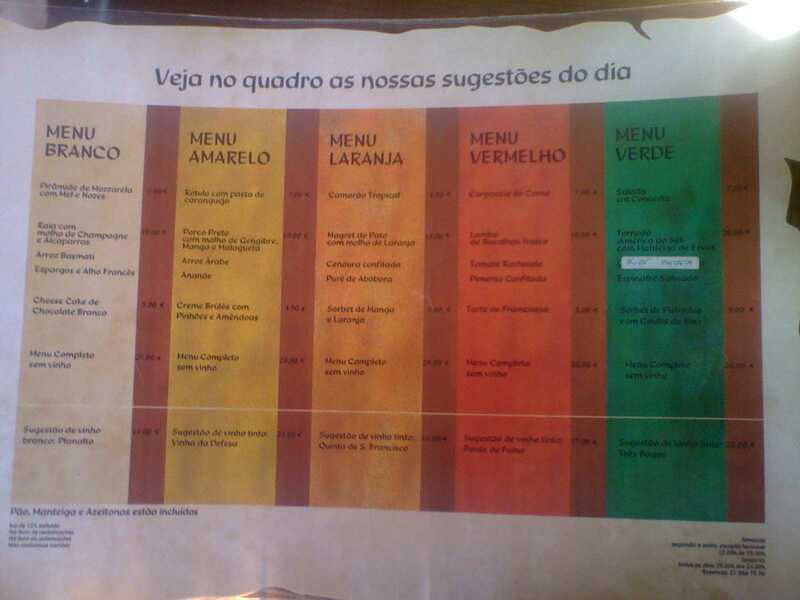 Rory Sutherland passes along this snapshot from Lisbon, Portugal, of a restaurant menu that nudges diners toward a wine selection. Even tourists with only a crude working knowledge of Portuguese should be able to figure out the suggested wine. (The wines are on the bottom row.) Of course, anyone can still easily order across colors. Wine lovers (like Thaler) will want to check out the Wine Economics blog maintained by the American Association of Wine Economists. 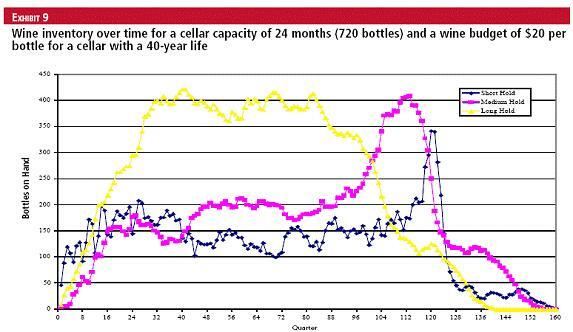 Serious wine collectors should take note of a paper (you need to create a free account to read the whole piece) by two Cornell professors, touted as the ” first scientific approach to optimizing a personal wine cellar.” The Excel graph for maintaining a 720 bottle cellar for short-, medium-, and long-hold wines, over 40-year time span, and a wine budget of $20 per bottle is reposted below. The state law amended the Illinois open-container law, allowing diners to carry resealed bottles home in a special tamper-proof, one-use-only bag. The amendment passed by wide margins in the Illinois House and Senate and took effect last year. However, (a U.S. Department of Transportation) letter says, the law failed to specify that the bottle has to be carried in the trunk or in the rear of the vehicle, in order to meet federal requirements. Illinois has 30 days to issue a rebuttal and show why its law does comply with federal requirements. The letter puts the state on notice that another 3% must be transferred next year unless the law is changed. A spokesman for the Illinois Department of Transportation says the state was “surprised by the letter and the stand they’re taking,” because federal authorities were notified about the change in the open-container law last year and no one “objected at the time.” The state is looking at amending the law or using regulations to make it clear that bottles must be carried in the trunk or rear section of a vehicle.